Ever since getting the 'Fever' for rhythmic displacement I've been thinking about its place in popular riffage. 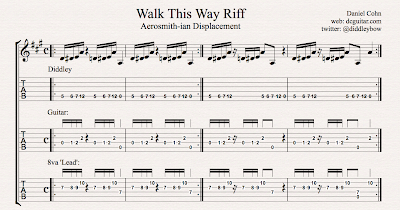 Here's another example of rhythmic displacement in a simplified version of Aerosmith's glorious 'Walk This Way' riff. Once again, four staves, as in this post. The first two measures make up a very un-funky version of the riff, simply to demonstrate how the the riff would sound if the second iteration of the sequence of four notes were not displaced to a very funky place: the second sixteenth note of beat two. Play it safe with the first two measures, then make it funky with the second two measures. Labels: Aerosmith , dcguitar.com , free guitar lessons , free guitar tablature , guitar lessons , Joe Perry , rock guitar , washington D.C.